What is We Choose Virtues? We Choose Virtues is a company created by Heather McMillan. Heather is a wife, mother, preschool teacher and a children's pastor. Her initial reason for creating We Choose Virtues was to encourage her own children to reach their full potential by instilling character traits in them. As Heather also worked with so many children outside of her home over the years, she noticed and became very concerned with the lack of good character skills and wondered how these children would grow to their full potential without the right foundation. She began to introduce the original list of virtues to her own four children, then to her preschool students and eventually to other teachers and counselors. The response was overwhelming and We Choose Virtues has grown greatly! For this review, our family received a pack of Parenting Cards (NIrV) (Price: $38.49) and a link to download more goodies including the Teacher Handbook ($5.00) and the Kids of VirtueVille Coloring Book ($3.00). What we received is aimed for ages 3-11. Our pack of cards included the following character traits: I am Forgiving: I choose to love when others hurt me. I am Helpful: I find things that need to be done and I do them. I am Patient: I wait, and wait, and wait with a smile. I am Diligent: I start fast, work hard and finish strong. I am Honest: I am a truth teller. I am Self-Controlled: I make myself do the right thing. I am Kind: I treat others the way I like to be treated. I am Perseverant: I can do it even when it's tough. I am Gentle: I speak quietly and touch softly. I am Attentive: I watch and listen carefully. I am Obedient: OK, whatever you say, I will obey, right away. 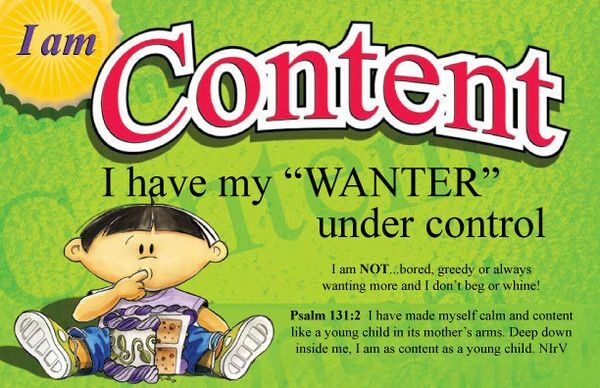 I am Content: I have my "wanter" under control. 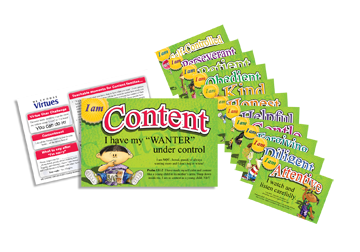 On each card, there are Teachable Moments, a story about one of the kids of VirtueVille, a helpful tip and a challenge. There is also a bible verse provided for each virtue. Using the Parenting Cards (NIrV) with my boys was a breeze and enjoyable. Kollin (7), Kolt (5) and Kruz (3), even though they are at such different phases in life, were able to learn and put into place the character traits I chose. The first morning of the week, I introduced the character trait to them and I would ask them to tell me what they already knew about this particular trait. As I would talk about the virtue more and introduce the kid from VirtueVille, they would color a sheet from the coloring book download provided. We had fun putting into practice throughout the week the tools and ideas provided to learn about each virtue. The Teacher Handbook was very handy as I prepared the week before. There were tips on how to introduce the virtue and how to instruct the virtue. There were also loads of encouraging words like how I should "expect excellence" for each of my children. Within the Teacher Handbook were also activities, inspirational quotes, personal stories from the writer and songs to sing to encourage the learning of the virtues. What Momma does not want to instill character traits like the ones listed above in their children? I was astounded at just how simple it was to teach my children the concepts we tackled over the time of our review period. And not only did the simplicity of it all woo me, but to see the growth my children have had over the last few weeks has made my heart skip a few beats. These cards have become such a wonderful asset to our home! In watching the boys learn from these virtues, I have been amazed at their personal growth and the change of how they handle problems together as brothers. I have been so encouraged by the boys and their willingness to learn about each virtue. I even found myself saying, "Kelsey, get your "WANTER" under control". The week we learned about being helpful, I never took the garbage out because Kollin had already done it, without being asked! These traits are ones that they will grow with and need as they become pre-teens, teenagers and adults. I am thankful for women like Heather McMillan who see a need for children and create a way for parents and teachers to provide a way to meet that need! Everything we received was of great quality as well. These cards will last us! And I am thrilled to have these for my other little ones in the future! We Choose Virtues offers a Download Bundle that includes the Teacher Handbook, a Family Character Assessment, the Butterfly Award, Coloring Pages and the Sing-Along-Song sheets for just $7.99! Although, I have only discussed the products we received as a family, We Choose Virtues also offers products for youth (ages 12-18) like mentoring kits and journals, products for schools, products for churches and much more.